Making Australia safe: Service delivery coordinator for the Centacare Family and Relationships Centre in Chermside Jesse Jones pledged to speak up against domestic violence on White Ribbon Day. Photo: Emilie Ng. FAMILY mediator Jesse Jones has promised all women living in Australia that he would stand up for them if they were ever put in a violence situation at home. 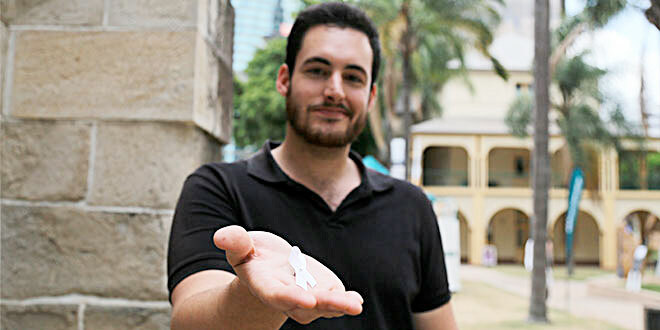 Mr Jones, who works for Centacare’s Family and Relationships Centre in Chermside, made a public pledge on White Ribbon Day to stand up and speak out against family and domestic violence. He joined more than 100 people to make a human ribbon outside St Stephen’s Cathedral, followed by a public pledge from all the men in the group to support women in vulnerable and dangerous situations. As a qualified counsellor and mediator with five years’ experience, Mr Jones deals directly with parents who, on a daily basis, have experienced domestic violence or initiate violence in their relationships. “Every single day are working with people to get to safety, remain in safety, and make some long standing arrangements to keep them safe,” Mr Jones said. He said despite the number of disclosures increasing, there have been increases in the danger and lethality of violence. Violence against women in particular “has tended to be far more dangerous and often far more lethal”. Between 80 and 100 Australian women die at the hands of their male partners every year. Campaigns like White Ribbon Day, celebrated across Australia today, highlight the importance of Mr Jones’ work. 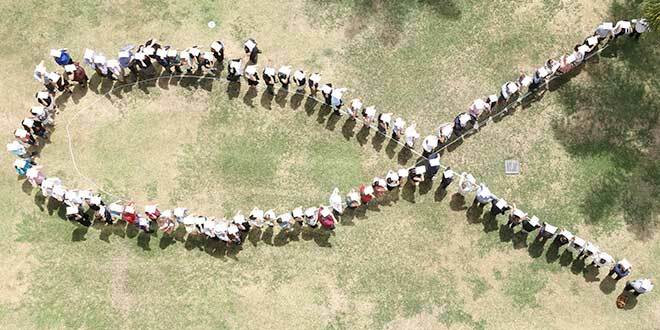 Public pledge: Employees of the Archdiocese of Brisbane created a human ribbon for White Ribbon Day. Photo: Archdiocese of Brisbane Communications Office. “I think the importance is that firstly we as a country want to tell women and children, and men, that violence in the household is never ok,” Mr Jones said. “And we want to tell people that there’s an entire country behind you who want to see your family be happy and healthy and safe, and do whatever we can to help. Family and Relationships Services Brisbane and Queensland’s north coast regional manager for Di Swan said awareness campaigns like White Ribbon Day were helping women to take a step forward in disclosing violence in the home. “We’re seeing women who have been in domestic and family violence situations for decades, who for the first time are reaching out to the services,” Ms Swan said. 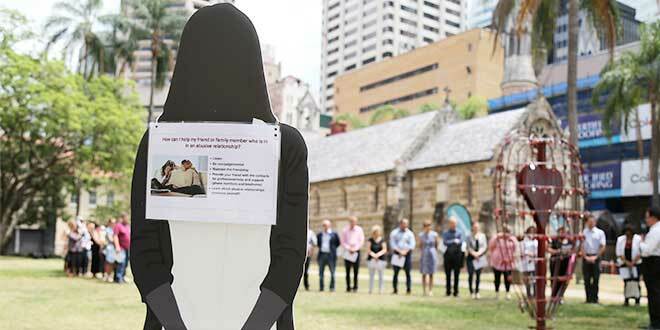 Ms Swan recently participated in the Brisbane archdiocese’s taskforce on domestic and family violence, Rewrite the Story, and said it had lifted the profile in the community. However, the campaigns have not made domestic and family violence disappear. “One of the other things I’ve observed, and we’ve seen this across our services, (is) an increase in the types of violence,” Ms Swan said. “So strangulation, pet abuse, we’re seeing an increase in the nature of domestic and family violence with ice and some of those really serious drugs, so we’re seeing an increase in those high risk factors around domestic and family violence. If you are in danger now, call 000 immediately. For more details on domestic and family violence services, visit Rewrite the Story’s DV Connect page.